This teriyaki chicken recipe has been going around my mom’s group of friends, and they all love it. I decided to give it a try, and I love it too. For such a simple recipe, the chicken is really flavorful. 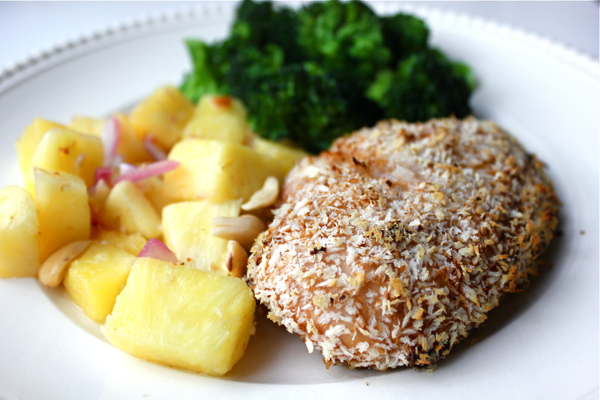 Paired with a warm pineapple salsa, this chicken is a sure way to brighten up any day. 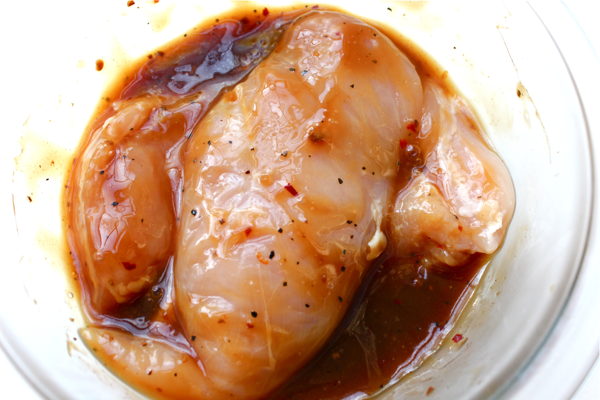 To make this chicken, marinate some chicken breasts in teriyaki sauce for a few hours before you want to cook them. When you’re ready to cook, preheat your oven to 400ºF. Spread some panko breadcrumbs in a shallow dish, and press the chicken into the crumbs so they stick. 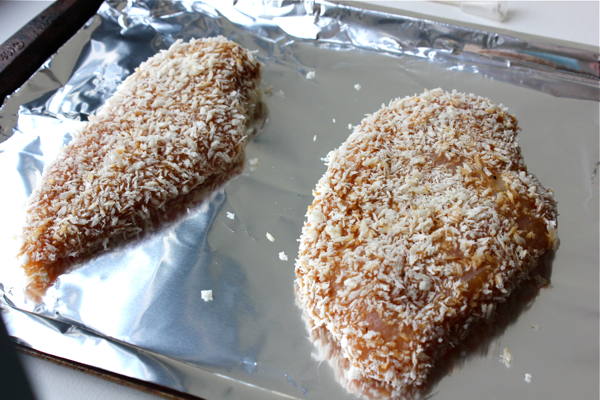 Place the breaded chicken breasts on a baking sheet, and cook them for 30 minutes or until the crumbs start to brown, the sauce looks dry, and the chicken is fully cooked. I recommend serving your chicken with warmed pineapple pieces. My mom sautés pineapple tidbits in their own juice with some teriyaki sauce and a few dashes of soy sauce until it gets a little thick. Then, she spoons some on top of the chicken. I heated fresh pineapple pieces and mixed it with diced red onion and chopped, toasted cashews. It was deliciously easy!